The Why: Of course, having fresh #fruit is always the best choice, but E4B (short for “Easy for Busy”) is really an extraordinary food product — and it’s pretty close to the “real thing.” In a nutshell, it’s blended fruit in a squeezable pouch — that’s it. There are absolutely no additives, no cream and no preservatives — nothing. The packaging is a unique squeeze pouch designed by NASA. It’s innovative, convenient and smart. I’ve been testing this stuff for more than a week, drinking a bit each morning for an energy boost, and I just think it’s great. What We Liked Best: All the flavors taste amazing, and the packaging is fantastic. My favorite is the Pear/Caramel; it’s off the charts. You can also use these to make frozen fruit drinks, as toppings for pancakes, or even as frozen desserts. Keep in mind, they’re not thick enough to use as a spread instead of butter or jam — but they’re rich, sort of like a smoothie. What We Liked Least: They’re made with apple and other juice concentrates, which isn’t terrible but does naturally increase the sugar content. What It Replaces: A candy bar, doughnut, muffin, ice cream. The Price: One case with 10 units is $29.99 — a bit expensive. Offerings: Mango, Pear/Caramel, Strawberry/Banana, Blueberry/Raspberry and Kiwi. Nutritional Information: Pear/Caramel, serving size 4 ounces or 1/3 container (280 #calories per container), calories 70, fat calories 0, total fat 0g, saturated fat 0g, trans fat 0g, cholesterol 0mg, sodium 15mg, total carbs 18g, dietary fiber 1g, sugars 16g, protein 0g. The Why: These crispy chips taste good, and at 120 calories per ounce they’re lower in calories than regular chips, which have 150–160 calories per ounce. Some chip makers attempt to go low-fat by baking their products, but that’s not the case here. Popchips are made by applying heat and pressure (no oil), which is kind of interesting. The Health Bonus: They have 1 gram of fiber per ounce; they’re not fried; and they’re all-natural. They’re flavored with heart-healthy safflower or canola oil and have no trans or saturated fat. What We Liked Best: You get about 22 popped potato chips for 120 calories, almost double the number of fried or baked chips you’d get for the same number of calories. And most people eat by volume (the amount of food), not by weight, so these chips could help you cut down on over-consuming. The company also makes popped corn, potato and rice chips. Our tasters liked the original potato Popchips best. What We Liked Least: They’re still 120 calories per ounce, and like any other chip or snack food they’re addictive, so watch your portions. What It Replaces: Regular or baked chips or pretzels. The Price: $2.50 per bag, or about $30 for a case of 12, 3.25-ounce bags. Offerings: Original, Barbeque, and Parmesan Garlic Potato Chips; Sea Salt, Hint of Butter, Cheddar, and Salsa Corn Chips; and Sea Salt, and Wasabi Rice Chips. Where to Buy: Popchips are now on the shelves in the salty snack aisle at all Safeway, Vons and Pavilion stores throughout the Western United States and are also available at Bristol Farms, Mollie Stone’s, Mother’s Market & Kitchen and on Amazon.com. Nutritional Information: Original Potato Chips, serving size 1 ounce (about 22 chips), servings per container: about three, amount per serving, calories 120, calories from fat 40, total fat 4.5g, saturated fat 0g, trans fat 0g, cholesterol 0mg, sodium 290mg, total carbs 20g, dietary fiber 1g, sugars 0g, protein 1g. Ingredients: Natural potato ingredients (potato flour, potato starch), safflower oil and/or sunflower oil, rice flour, sea salt, soy lecithin (processing aid). The Why: They’re lower in calories than dried equivalents, have no added sugar, no preservatives and taste great. 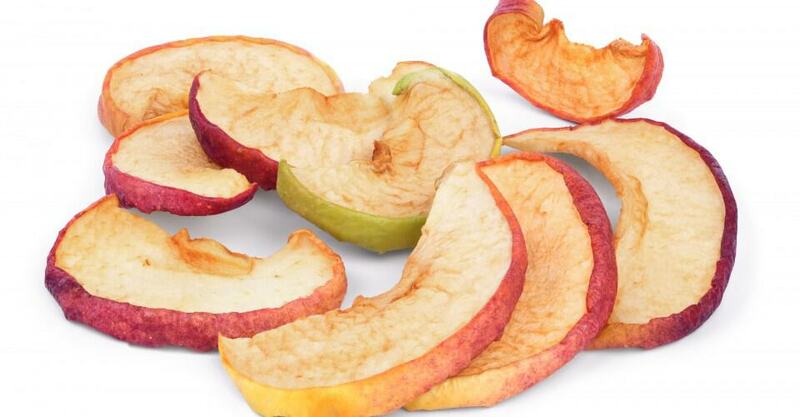 The Fuji Apple and Asian Pear crisps are about 40 calories per serving. They can even be stored in your car or bag for when you get a case of the hungries. The Health Bonus: Two grams of fiber per bag! Plus, you get all the great health benefits of fruit (e.g., antioxidants). What We Liked Best: The portion-controlled bags, and that there are absolutely no additives, preservatives or added sugar — just 100 percent natural fruit. What We Liked Least: They go fast, so just make sure to eat only one bag … resist the urge to grab a second. And if you leave an opened bag unfinished, they tend to get soggy quickly. What It Replaces: Potato chips, pretzels, candy. The Price: About 99 cents per bag (with certain minimum purchases). Online you can purchase 24 for $19.99 plus shipping. Offerings: Banana Fruit Crisps, Fuji Apple Fruit Crisps, Asian Pear Crisps, Pineapple Fruit Crisps, Strawberry-Banana Fruit Crisps, Strawberry Fruit Crisps. Where to Buy: Available nationwide at Costco Wholesale, Whole Foods and other chains. They’re also sold on Brothers’ Web site, or you can order by calling 585-343-3007. Nutritional Information: Fuji Apple, serving: ½ cup, calories 39, fat 0g, cholesterol 0g, sodium 0g, carbs 9g, fiber 2g, sugars 6g, protein 0g. Ingredients: 100 percent Fuji apples. The Why: We are always crunched for time. Kids, family, pets, errands, shopping, work, the list is endless. Well, these new products from Ziploc and Glad are real time savers. Basically, you take your washed vegetables, dump them into the bag, seal it, toss it in the microwave, and three minutes later you have crisp-yet-tender steamed vegetables — without adding water or dirtying a single pot … wow! You can make real meals, too. Both companies offer recipes on their Web sites. The Health Bonus: One of the biggest excuses for not cooking healthy meals is the time it takes. Well, now you can whip up a healthy meal quickly and reap all the benefits of using little or no oil, fresh vegetables and lean meat or poultry. What We Liked Least: They’re expensive, and you can’t reuse them. Also, a few of the Ziploc bags popped during use. What It Replaces: Fast food and mushy vegetables. The Price: Ziploc bags are $2.79 for a pouch of 10 medium bags or a pouch of seven large bags. Glad bags come in packages of 10 at a suggested retail price of $2.99. Offerings: The Ziploc bags are available in two sizes: medium (two-to-three servings) and large (three-to-five servings). Glad bags come in one size. Where to Buy: At supermarkets nationwide. Ingredients: What about the health risk of cooking food in plastic? Both companies say they do not use polyvinyl chloride (PVC), the chemical we’re supposed to be concerned about when heating plastic.